What Does This Eclipse Mean To America? Will it Rip Us Apart? Meanwhile, there is another population of people (light workers, pacifists and peace makers, spiritualists, mystics, visionaries and many other astrologers to name a few) who believe something entirely different is coming as a result of this eclipse. They see humanity rising as light beings with love in our hearts. They see us healing our Country and the planet. They see the awakening of humankind, not of a single savior. The recent violence in Charlottesville, Virginia and the clear message from the white-supremacists that they believe they have been given license to take America “back again,” (as if they ever had it to begin with) is concerning enough. But that our current President has given them the approval to do so is a frightening shift in our republic. The study of this impending eclipse has taken on a magnitude of importance that’s difficult to comprehend, and we’re just a few days away from the actual event. What more can happen? How much rockier can things become? There is another rally in Boston this weekend. Let’s pray there’s no violence. While one side is interpreting the “fire” of August and the qualities of Leo, the “king of the jungle” as being the President doing magnificent things, the other side is looking at Humanity doing brilliant things to further the unfoldment and spiritual evolution of our species. The two paths are mutually exclusive since one stems from bullying, isolationism, nationalism and polarization and the other stems from infinite, unconditional love and an understanding of these energies as they attempt to emerge and take root in the hearts of humanity. Using the obvious display of power that occurred in Charlottesville on August 12, 2017, some people believe that the white-supremacists in America are taking control of America and “getting their country back,” while at least 60 percent of Americans believe in the freedoms protected by our Constitution and Bill of Rights. In the days since the 12th Generals and Admirals in the military have come out against white-supremacy, racism, and bigotry, defying the President. When in the history of our country has the Military denounced the President, their Commander in Chief? Never. We are completely polarized over the Nazi, white-supremacy in our country. Both sides cannot be right about what this eclipse represents. Both sides can not win. The long and short of it is, if any of the predictions are to come true, there will be vast numbers of people disappointed and heart broken. (It sounds like the 2016 election, doesn’t it?!) There’s no way of knowing which side it will be or if perhaps some third unimagined option is in the making and we’ll all either be pleasantly surprised or jointly devasted. It’s impossible to know. The Eclipse does have the energy of surprise. Do you want to know a bit more about any of this? Are you curious about astrology or do you think it’s all just bunk? If there were ever a time that you could witness Astrology “in action,” it’s right now. Let me also mention, if you’ve been feeling a little wacky, or as if life is moving exceptionally fast, or if things seem really intense or debilitating even, that is this eclipse! Relax! There’s nothing “wrong” with you! This is big, everyone is feeling it in one way or another! I’ll walk through the salient points of a bit of astrology as simply and briefly as possible just so you get an idea of what people think is going on as it relates to our Country and President and why/how they can see him as the 2nd coming as some do. I figure any way that we can understand each other so we can find common ground is a good thing. It can’t hurt, right? When society seems at a breaking point, we always turn to the Sages and Mystics. This time is no different, for we are close to some kind of breaking point right now. We may have crossed that breaking point on Saturday, August 12. Eclipses are harbingers of change and disrupters of the status quo. During eclipses, we are forced to look at the shadows and deal with what we find there. They mark new beginnings. They are meant to move us forward. They can serve as a “reset” button. (Remember, the impact of this Eclipse has already begun.) Things can happen instantly or they can take months to come to fruition (or both I suppose). The solar eclipse August 21st is taking place when the Sun is in Leo at 28.53 degrees. 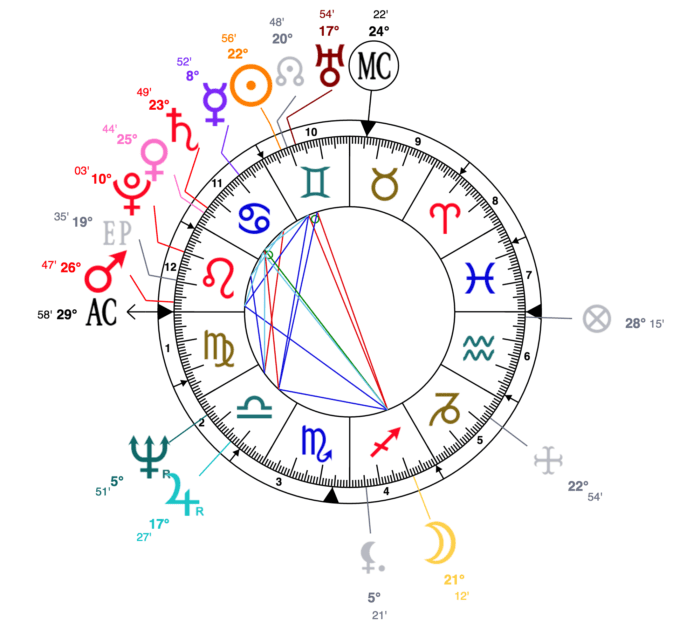 The reason some people think there is a cosmic connection between our President and the eclipse is that the position of his rising sign in his birth chart is at 29.58 degrees Leo. In the world of Astrology, this is considered a strong conjunction, which implies strong influence and a blending of the energies of the two (the qualities of the Sun and the qualities of the rising sign). It is a time of growing personal awareness, and it may take a year or more to fully express itself. With it, there is a possibility of coming to a new way of being or entering a new phase of life. There is also a specific significance to the numbers 28 and 29, the degree of the sun and the degree of the President’s rising sign in Leo. 28 is an invitation to mastery, and 29 is the indication mastery has been achieved but has likely been used dysfunctionally and the there is an invitation of the atonement of your life. The number 29 implies that you have mastered the energy (in this case the energies of Leo (king of the jungle)) and that you’ve used the energy in a dysfunctional way in the past, and this is the final invitation in this lifetime to use the energies for the good of all in a functional way. Think of 29 as the degree of karma. Not where karma is good or bad, but where karma is the completion of the energy that we’ve put into life, coming back around. In this placement as the last degree of the 12th and last house, it would signify where we are given the possibility of transcendence, reconciliation, and embodiment of Christ energy. Placed as the last degree on the wheel it is the ultimate offer of ascension. But 29 can also represent a problem with decision making and vacillation. As we will see, it is placed at the end of the wheel in President’s chart. It is that moment when he can either ascend and become one with the All That Is, or he can come back around and start the lesson again. It does appear there is a huge opportunity and time of choice ahead for our President. If his behavior and statements on August 12th and August 15th are any indications of what lies ahead, we are in for some very challenging times. He is certainly not giving us any indication that his heart is about to open or that he is in any way about to see the error of his ways. This is where the other coincidence in his chart may come in. The President was born during a lunar eclipse! Isn’t that fascinating? His rising sign is aligned with this solar eclipse and he was born under a lunar eclipse. As noted, Leo is in the President’s 12th house, which is the house of endings, healings, closure, and spirituality. It is also associated with separation from society, institutions, hidden agendas, and secret enemies. It rules creativity, imagination, and the subconscious. It is the house of completion. It tends to rule our mental health or our state of mind. As if many of these are not dark enough subjects, additional rulings include self-undoing, secret affairs, sickness of husband or wife, murder, assassination, and suicide. It’s hard to know which way the coming weeks and months are going to go energetically but let’s hope for happy outcomes for everyone, shall we? Some of this sounds terribly ominous. In light of Charlottesville even more so. I believe it is important to stay hopeful and positive and think of all things from a place of love and acceptance of what is while standing firm for what we know to be the most functional way to live: from a place of love. His fans expect from him some kind of miraculous transformation, not unlike what the Cowardly Lion experienced when he received courage. Although the President was already given a purple heart by a fan, no act of bravery was required, nor did he seem to change in any positive way as a result. Perhaps, in this case, it will be a transformation akin to that of Saul to Apostle Paul? Could it be? Is it really possible? I’m not holding my breath, but I am waiting. If you read the aspects in his transit chart for Monday, August 21, 2017, they are all quite favorable and would lead one to the idea and awakening might occur. Remember there is that energy available to us all. A transformation such as that would certainly be a miracle, and that is indeed what many devout followers of the President, especially the evangelistic “Christians” are counting on. To others, it will be a coming to our senses. It will be transformative in a way many have dreamed of since the inception of our Country. We will finally become what our forefathers dreamed of, a land of free, happy, inclusive people. Given our current path, it certainly seems doubtful that our Founding Fathers are happy at the moment. There is also the possibility that the President awakens and becomes the Great Uniter and gets the anti-Semitic, Nazi, KKK, white-supremacists, etc. to give up their ways and beliefs. Because that’s what’s called for to have peace within America for all citizens. Another aspect of the fascination with this eclipse and our President is the impact the eclipse will have on America the country. As you’ve likely heard, this solar eclipse will traverse America from one coast to the other, cutting a large swath of darkness (The Path of Totality) across the country and plunging millions of people into the dark for a few minutes. The last time the United States experienced an eclipse similar to this was almost 100 years ago on June 8, 1918. I’m not sure we have any idea what to expect, or what is coming. It does feel as if the Country is being ripped apart. There are people who have never wanted a Federal Government, and there are people who don’t agree with the idea of the utopia of the Founding Fathers. They each envision a different world than what the vast majority of us dream of. In order to fully understand the powerful impact of this eclipse, as we did briefly with the President’s chart, we need to also consider where Leo appears in our Nation’s birth chart. As pictured here, what we can see is that Leo appears in America’s natal chart in the Eighth House, and extends into the 9th House. If we look at the degree of the eclipse, at 28.53 Leo in the chart for the U.S., it’s in the 9th house. The 9th house represents our search for meaning and is commonly called the House of Philosophy. The 9th house is all about understanding: understanding what we feel and see and probing in the shadows seeking the experience and realization of true meaning. This is the house of abstract thinking, universities and higher education. It is also the house of legality and rule of law, and religion. Sagittarius rules the 9th house, which is also the house where we find our own God and it brings us to a grander vision of the world. It is the house where we draw the conclusions based on our experiences thus far. It is the most mature of the 3 fire signs, it is the house of synthesis and of our global vision. If you’d like to see where Leo appears in your natal chart to see how this eclipse might be impacting you and you don’t have an astrology chart of your birth time, just go to AstroDienst and look for Chart Drawing/Ascendant on the home page in the 3rd scrolling box. You can cast and print your chart out from there. Knowing your birth time is extremely helpful. If you have no idea what time you were born and there’s no one to ask, then decide when in the day you are the most energetic and pick 12 hours earlier for your birth time. This will likely get you close. The way to fine tune your birth time, is to look at the house placements and how shifting them impacts your chart. You’ll instinctively know when you’ve nailed it because descriptions of houses and the things placed in them will describe you. A good astrologer can help you fairly quickly because they can tune into your energy intuitively to help fine tune your chart. The other chart, with Gemini rising, is a chart that best describes the character of America, its ideals, rather than what’s actually happened. Personally, I think it is both. Some people may have signed at one time, and likely the last signature was at another time. Especially since the Gemini rising chart is early in the day and the Sagittarius rising sign is later. Leo is in the 4th house in the Gemini rising chart, which eerily is the house of heredity, family, home and the mother and mother-figure. It is the house of our roots, our native family, and our home: both the home we come from and the home we set up. So the beginning of our country, the earlier time on July 4th is about our roots and the later time is the house where we find our own God, and we arrive at a grander vision of the world. It all makes such perfect sense, don’t you feel? With Sagittarius as the rising sign (also a fire sign) and the eclipse hitting the country’s 9th house in Leo at 28.53 degrees, it is the dream complete. It signifies the vision crowned it is the grandest version of society ever attempted, a free democracy where all are created equal and have the freedoms of life, liberty and the pursuit of happiness. It makes perfect sense. So this is the chart, I believe, to use when comparing to the eclipse, or to our President. For the time being, we are left in the place of the unknown. Personally, it feels as if we have entered some kind of suspended animation, with the energies of the Universe are superseding what we are doing, eclipsing what we are doing if you will. Every day I wake up and start by centering myself and preparing myself for what I may find when I look at my phone or turn on the news. I’ve taken to doing neither until I absolutely have to. But I know that I have a civic duty to pay attention very carefully, especially right now. We all do. After going to bed in tears over the displays of hate in #Charlottesville, Virginia, I woke up to the state of emergency declaration because the protests continued and as could be predicted, turned violent. Attendees from the alt-right Nazi white supremacist side showed up with guns and bats, shields, etc. They were prepared to fight. Heather Heyer was murdered by a Nazi on American soil on Saturday 8.12.17. It took until Monday for the President to denounce the Nazis and white supremacists. On Tuesday he basically renigged on the denouncement and went back to the endorsement of them. As we prepare for the eclipse of the Century to rip across our nation, our country is tearing itself apart. We are being plunged into darkness and then we will emerge into the light ~ will we have learned anything? Is there a way to unite? Is there a way to heal our country? It certainly seems we are going to find out soon. One way or another. I hope you’ve enjoyed this exploration. I don’t spend a lot time in this realm but it seemed a timely and necessary topic. Here’s a chart to help if you are not familiar with the symbols. P.s. You can read more about the POTUS’ birth chart here. It’s rather interesting reading. The Great American Eclipse also occurs at the Moon’s North (Ascending) Node, which is another old astrological symbol that it’s time for something new to be born. Another clue: the Great American Eclipse occurs at 28 degrees of Leo, which is exactly opposite the position of the Moon (27 Aquarius) at the birth of the U.S. on July 4, 1776. If the Sun is the king or leader, the Moon is the public. It’s also the foundational values of the nation — our national soul —that we must reclaim from the shadow.